Converting social media prospects into customers takes work. Further, your job as a marketer doesn’t end when you close the sale. While a social media prospect may buy from you once, they won’t buy from you again unless your product or service delivers on its promise. Although you may argue that you got paid for the purchase, the problem is that in today’s always-connected world, a bad review or social media rant is an arm length away. Acquisition of a prospect or generating a lead via social media is only the beginning of the sales process that isn’t fully realized until they make their first purchase. Even more important is getting that customer to buy more from you again and talk about your products to their family and friends because this is where the major impact of social media is. As a result, social media conversion is an iterative process that requires continual refinement. To convert social media prospects into customers, here are seven actionable marketing tips . Know who your prospects are. Think beyond the buyer. Also consider influencers, decision makers, the end user, social media connections and the public. To this end, it’s useful to create both marketing personas and social media buyer persona to help your team better know your target market and be able to craft effective content. Showcase the star qualities of your offering. Like real life celebrities, make your products and services into VIPs by strutting their best features in the environment in which they’re to be used. Use photographs and videos to highlight styling. Customers need this information both pre-purchase and post-purchase because if your product doesn’t get used, customers won’t buy from you again. Include contextually relevant call-to-actions to motivate prospects to act. Don’t assume that visitors will take the next step without a push. Also, they may need to view your content several times in different contexts before they’re ready to buy. So incorporate different calls-to-action to motivate prospects to take the next action towards purchase. Create targeted landing pages for your calls-to-action. Incorporate the same creative and content to signal to prospects that it’s part of the same process. Bryan Eisenberg refers to this as scent. Remember one size doesn’t fit all! To the extent that your resources allow, develop more targeted landing pages. Measure results against your business goals. This means determining your metrics so that they’re aligned with your objectives rather than collecting whatever information is available after you execute your marketing. Also, check that your analytics can capture useful information at each step of the process. 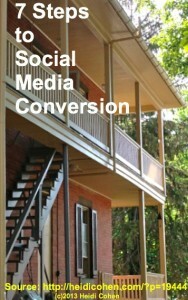 Social media conversion is an on-going, work in progress where you gather incremental learning from each campaign. You must continue to repeat the process to improve your results since platforms, contexts and effectiveness change over time. What has been most effective in your conversion process and why? What challenges have you found? Tags Actionable Marketing Tip, Call-to-action, conversion, social media conversion. Bookmark the permalink. Treat it like science. Come up with a theory, test it, then analysis it. Find what works and roll with it, if it doesn’t work, change it up.